The new heart-warming and hilariously brilliant story from number one bestselling author David Walliams. Beautifully illustrated by artistic genius, Tony Ross. Dads come in all sorts of shapes and sizes. There are fat ones and thin ones, tall ones and short ones. There are young ones and old ones, clever ones and stupid ones. There are silly ones and serious ones, loud ones and quiet ones. Of course, there are good dads, and bad dads . . . A high-speed cops and robbers adventure with heart and soul about a father and son taking on the villainous Mr Big - and winning! This riches-to-rags story will have you on the edge of your seat and howling with laughter! 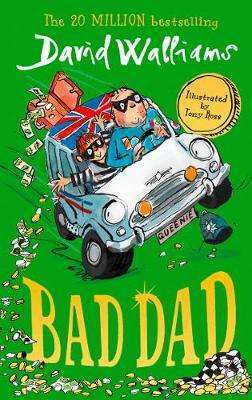 Bad Dad is a fast and furious, heart-warming story of a father and son on an adventure - and a thrilling mission to break an innocent man into prison!